STATE BLITZKRIEGS DETROIT TO GET DEAL WITH WALL STREET; WILL COUNCIL STAND UP AT MEETING DEC. 11? Detroit Project Management Director “Kriss” Andrews, a joint Snyder-Bing appointee, tells City Council austerity measures including lay-offs, attack on pension funds, will continue even if it votes for contested contracts, during meeting Dec. 4, 2012. Andrews has no experience in public sector “turn-arounds,” only with private corporations. DETROIT – Gov. Rick Snyder and the State of Michigan are likely laying siege to Detroit, threatening an emergency financial manager takeover, as part of a pact with Wall Stree. In return, the state got a “historically low” interest rate of 1.16 percent on a $100 million state bond re-financing deal, among other factors. Wall Street downgraded Detroit’s debt the same day the state announced its deal. Moody’s investor ratings firm sent the city to debtor’s dungeon, with rates plummeting from B3 to Caa1, and Caa1 to Caa2, as a result of Michigan voters’ defeat of Public Act 4 Nov. 6, and legal challenges to the use of PA 72 in its place. They even lowered debt ratings for the Detroit Water and Sewerage Department (DWSD), which is not in deficit. This means investors in Detroit will profit from heftier interest rates, if they invest at all. 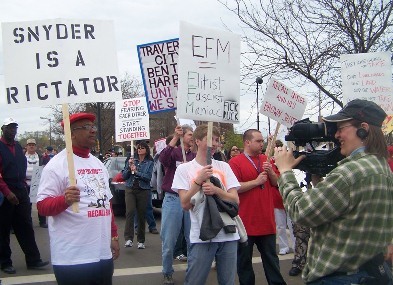 Marchers in Benton Harbor, first victim of PA 4, including Rev. 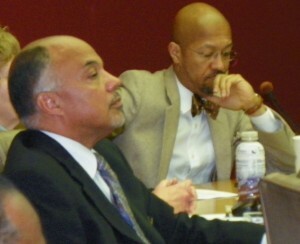 Edward Pinkney at left, May 7, 2011. Dillon’s communications office has not responded to an inquiry from VOD asking whether the two events are related. Dillon is now threatening to impose an “emergency financial manager” on Detroit under Public Act 72, telling the Detroit News he met with Detroit Mayor Dave Bing and at least some City Council members to discuss the possibility. He claimed he would ask for a 3o-day review of the city’s finances this week as a first step in the process. If the Court rules in Davis’ favor, no such EFM could be imposed. The Council is set to meet Dec. 11 at 10 a.m. to further discuss issues involved, with residents wondering whether they will succumb to Dillon’s threats of an EFM just they did to threats of an EM when they voted 5-4 for the PA 4 consent agreement. Atty. Michael McGee of Miller Canfield, signer of proposed contract amendment. Issues on the table include an amended contract renewal with the Miller-Canfield law firm, a co-author of Public Act 4, the consent agreement, and a $137 state loan connected to it, which the Council deemed conflicts of interest. It is also set to vote on the sale of 1,558 parcels of land to Hantz Woodlands (see separate story below). Their advice was in line with State Attorney General Bill Schuette’s declaration that PA 72 has been restored, a matter that is still unresolved. Will the Council call what appears to be Dillon’s bluff? 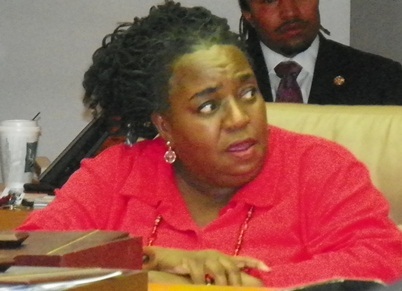 During the Dec. 4 meeting, City Councilwoman Watson cited recent recommendations from Daniel Cherrin, formerly communications director to former Mayor Kenneth Cockrel, Jr., and now a public affairs and strategic communications consultant. “Dan Cherrin says the state is ready to sit down with the Mayor and City Council and put everything on the table, including the $224 million in state revenue-sharing funds it owes Detroit,” Watson declared. 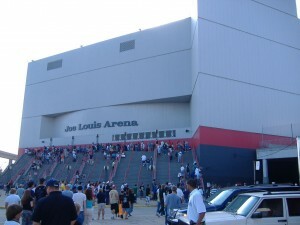 Joe Louis Arena at its current location. Owner Mike Illitch has announced a $670 million project to build a new arena in the Cass Corridor area, while tens of thousands of Detroiters are homeless, unemployed and poor. She added that Joe Louis Arena, the Detroit Medical Center, and numerous other entities, additionally owe the city up to a total of $800 million including the revenue sharing funds. She demanded that the city re-hire 80 revenue collectors it laid off to get those debts paid. She also said the city needs to take advantage of the re-election of President Barack Obama and go to Washington to ask for funding assistance in return for the record voter turn-out supporting Obama in cities like Detroit. 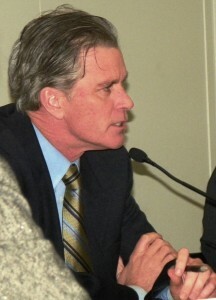 Watson recommended that the City Council draft its own “Milestone Agreement” to counter the one signed by Dillon and Bing. 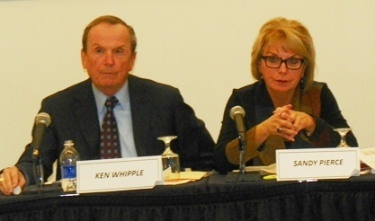 Financial Advisory Board VP Kenneth Whipple, former CEO of Consumers Energy, and Pres. Sandra Pierce, former CEO of Charter One Michigan, whose parent company, the Royal Bank of Scotland, is one of many global banks currently being sued by cities across the U.S. for criminal manipulation of interest rates, in LIBOR scandal. 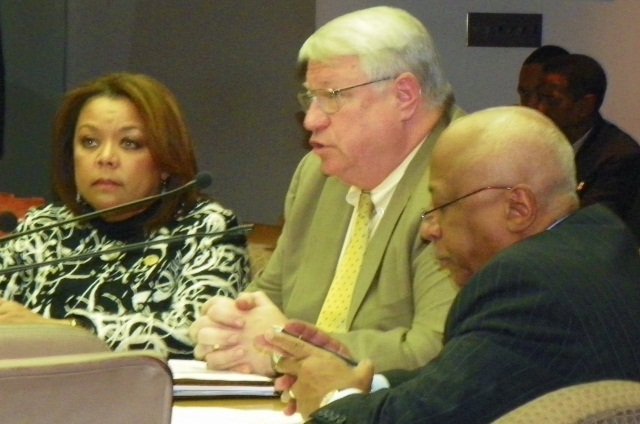 She clearly referred to Detroit Project Management Director Walter “Kriss” Andrews (in photo at top), being paid $220,000 a year essentially to “de-structure” Detroit, and the nine-member Financial Advisory Board. Andrews previously worked as a so-called “turn-around” expert only with private companies. He has no experience in the public sector, whose goal is service to the people, not profit. Andrews took what was supposed to be Bing’s seat at the table Dec. 4, while Bing was visiting San Francisco to keep a sports bet with that city’s Mayor. 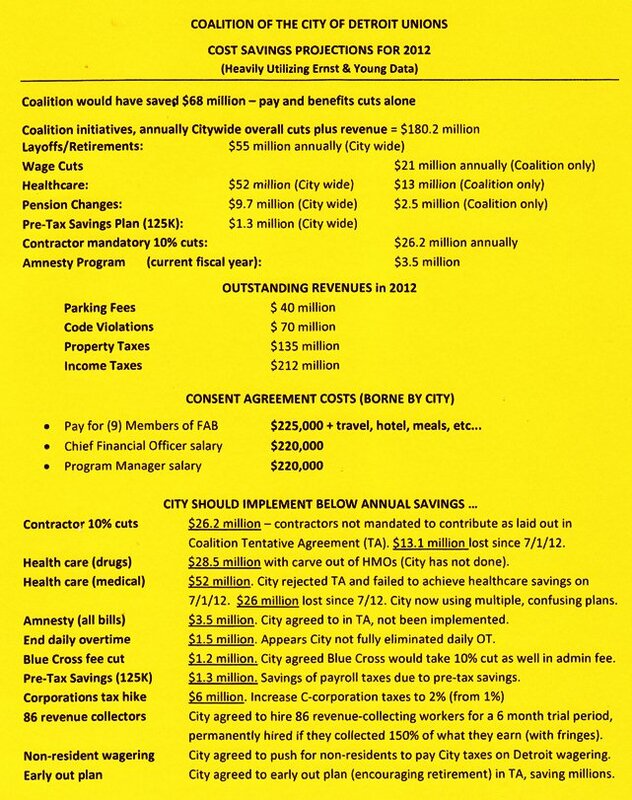 Andrews alleged that the City faces a deficit of $47 million June 30. Since then, daily media reports have arbitrarily raised the figure to $68 million. 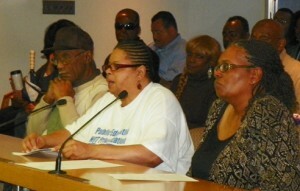 People vs. the banks and state at council meeting: Tyrone Travis, Sandra Hicks, Catherine Phillips. He said that even if Dillon releases the $30 million, it will not solve the city’s fiscal problems and painted a picture of austerity measures stretching far into the future. Corporation Counsel Crittendon has had several closed sessions with the City Council to discuss the impact of the repeal of Public Act 4 on the very existence of the FAB and officials like Andrews appointed under the city’s PA 4 consent agreement. It is expected that she may take legal action. Council Pres. Pro-tem Gary Brown, Pres. Charles Pugh: will they sell out to the banks and state Dec. 11 as they did April 4? During public comment, many urged the immediate removal of all consent agreement-related entities and personnel, and against the Miller-Canfield contract. She and others urged people to call 313-744-3381 to join a campaign to recall Mayor Dave Bing for his complicity with state officials. June Nickleberry, Pres. AFSCME D-DOT Local 214. 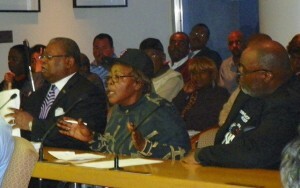 June Nickleberry, President of AFSCME Local 214 representing clerical and maintenance workers at D-DOT, along with Ed McNeil and Catherine Phillips of AFSCME Council 25 and its attorney Richard Mack, said the city would save a total of $180.2 million under plans proposed by the Coalition of City Unions in January. Russ Bellant added to testimony by this reporter calling on the Council to stand up to the banks, including Swiss-headquartered UBS, which is the lender on what now amounts to over $2 billion in so-called “Pension Obligation Certificates.” He noted that the U.S. government is currently negotiating with UBS on another matter described in a Bloomberg.com article. “Hundreds of wealthy Americans are revealing they have offshore bank accounts as the U.S. and Swiss bank UBS AG negotiate to resolve a lawsuit seeking the identities of 52,000 Americans suspected of tax evasion,” said Bloomberg in a July, 2009 article at http://www.bloomberg.com/apps/news?pid=newsarchive&sid=ajTou_vRuqkE . Tyrone Travis called on Detroiters not to depend on the Council, but to look to the people for solutions. 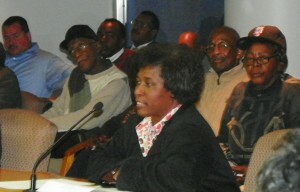 Community member (center)expresse outrage at Council meeting Dec. 4, 2012, as Ed McNeil (l) and Les Little (r)listen. “We are going from the pillar to the devil,” he said. “Ladies and gentlemen out there in TV land [Council sessions are televised], you had better organize yourselves,” he declared. To download and print copy of CCU chart above, click on CCU savings. 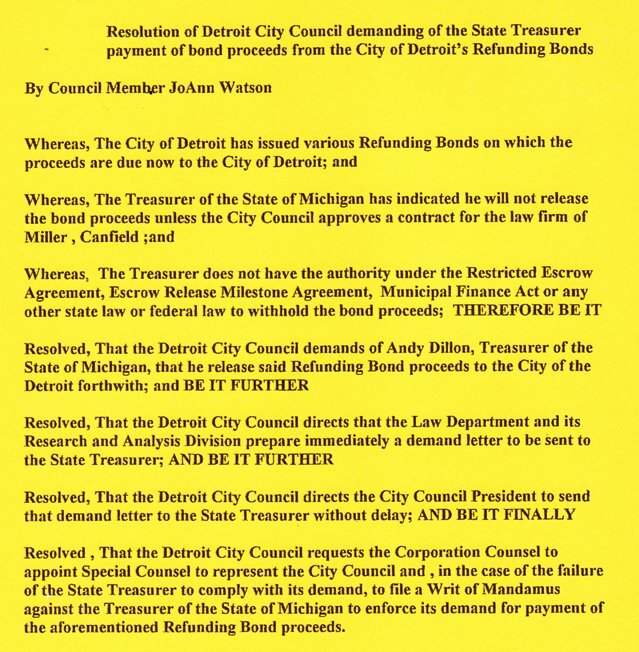 One Response to STATE BLITZKRIEGS DETROIT TO GET DEAL WITH WALL STREET; WILL COUNCIL STAND UP AT MEETING DEC. 11? I read your article on the Hollywood Star, Mr Glover, speaking on the Hanz land sale. If he really felt that strongly about this situation, why didn’t he just purchase the land, and initiate some proposals that would have been better for the community than the proposal by Hanz? To a movie star of his high ratings, and financial assets, he easily has the econ0mic ability to perform deeds that coincide with his beliefs. In fact, he did nothing, but give the Detroit citizens some of his valuable time with his appearance. While the Hanz purchase may not be the best option, at least someone is actually taking some direct action to attempt to return Detroit to its glory days.